I've only ever eaten canned sardines, never the fresh ones. And I never knew we have fresh sardines in our markets! The fish monger (seems like such an antiquated word) insisted that sardines taste better than the big-eyed scad (tai ngan chee) and the yellow-tailed scad ( wong mei chee) that I was checking out and that I'd go back for more. He was absolutely right. Sardines are savory-sweet with finer and moister texture than the scads, small fish that we shallow-fry in oil until crisp and dry outside. Small fried fish with rice and a dip of hot chili, lime juice and soy sauce were something I suddenly longed for one day last year when I was on a 2 1/2-month holiday in Europe. I've been back to the market many times but never found any more sardines because according to the fish mongers, the sardine season is short and most of the sardines are bought by the canneries. I don't give up though, and if I see fresh sardines again, I'm going to buy a ton of them for freezing. Now that I've eaten fried fresh sardines with rice, I can't go back to the scads. 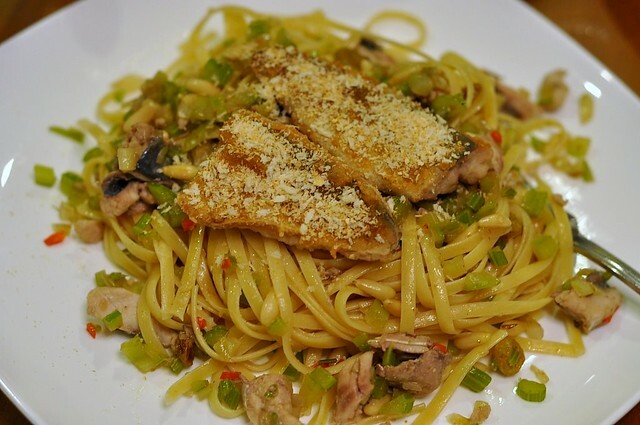 I've been saving my remaining sardines for this classic Sicilian pasta dish but unfortunately, I couldn't get any fennel. Enough of waiting, I thought, so I substituted fennel with celery. One day when I find fresh sardines and fennel, I will cook this again but I will cook the less classic but popular version, the one with tomato paste. That is, if I can save enough sardines for it because I think shallow-fried sardines with rice, soy sauce and lime is still my favorite way to eat small fishes such as sardines and scads. You can find the recipe for this dish in most Italian cookbooks. I based mine on the recipes from Mediterranean by Jacqueline Clark and Joanna Farrow (which said to use dill, not fennel, and I wonder if it's a lost-in-translation thing) and also Jamie Oliver's Jamie's Italy. However, I later found another recipe that seems to taste better because anchovies and saffron are part of the ingredients. 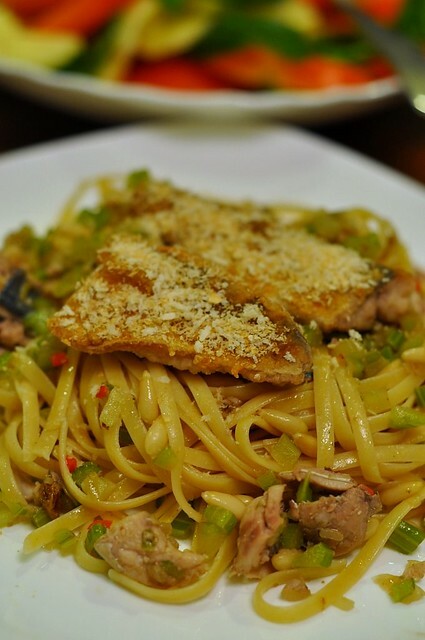 No wonder Yi said something seemed to be missing in my version of pasta con sarde. The kids, I can't fool them anymore. The following recipe is an adaptation of the recipe I did, plus some improvements that I think will make the dish better. 1. 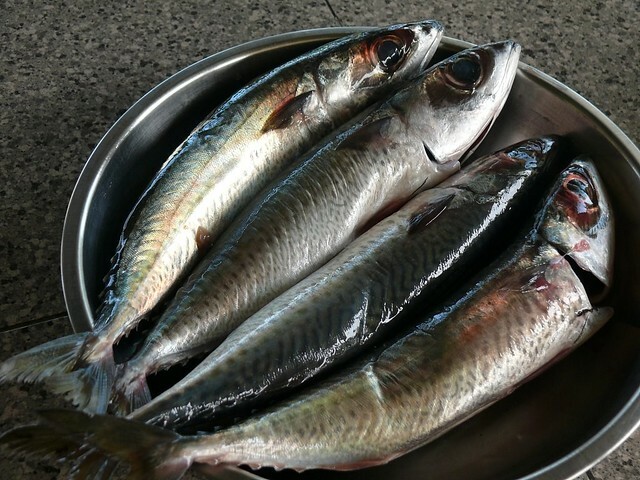 Clean sardines, remove the heads and fillet them. If big, cut each fillet into 2 lengthwise. Pat them dry with paper towels. Cut 2/3 of the sardines into 1" pieces. Leave remaining whole. Dry-fry the breadcrumbs in a frying pan until golden. 2. Lightly coat the whole sardine fillets with plain flour and fry them in a frying pan with some olive oil until just cooked. Reserve. 3. Add 4 T oil into the pan and fry the onions, fennel, fennel seeds, anchovies and chili, cooking gently in medium heat low until the anchovies are almost melted, about 15 to 20 minutes. Add the cut sardines, the pinenuts, the raisins, the saffron water, the saffron water and and cook another 15 to 20 minutes. Season to taste. Mix in a drizzle of EVOO. 4. Meantime, cook the pasta in salted water until el dente. Remove, mix in 1/2 the sardine sauce and 2 T fried breadcrumbs. 5. Divide the pasta into 4 or 5 portions onto individual plates, top with the remaining sauce and garnish with the whole sardines, remaining breadcrumbs and the chopped fennel tops. You can also add 2 T tomato paste and 3 Roma tomatoes that have been peeled, deseeded and chopped at step 3. This sounds tastier and I will do this next time I cook this dish.